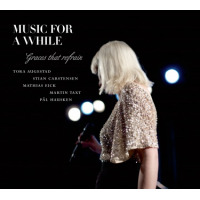 Five years have passed since Norwegian quintet Music for a While released its debut, Weill Variations (Grappa, 2007), a collection of fresh, outspoken versions of Kurt Weill songs. Now this dream team bandheaded by cabaret diva Tora Augestad, with accordionist Stian Carstensen (leader of Farmers Market), trumpeter Mathias Eick (from Jaga Jazzist and a leader in his own right), tubaist Martin Taxt (from the Trondheim Jazz Orchestra and Koboku Senju) and drummer Pål Hausken (from In The Country)delivers a magnificent chamber jazz transformations of classical repertoire, songs ranging from English Renaissance, Baroque and Romantic eras to the present. Unlike the playful spirit of its debut, Graces That Refrain tends to be serene and subdued. The quintet begins with two arrangements of songs by John Dowland, "Flow My Tears" and "Come Again." Augestad performs these gentle songs with a commanding, warm voice, fragile sensitivity and great reserve. The beautiful melodies are sketched simply by Eick and Carstensen, with gentle touches by Taxt and Hausken. Franz Schubert's lieder, "Der Leiermann," from his Winterreise song cycle, receives a slow, contemplative arrangement with Hauske's imaginative percussion. It is followed by two romantic songs by Francis Poulenc, "La reine de Coeur" and "Les Chemins de l´amour," both highlighting the vulnerable expressiveness of Augestad's voice and Eick and Carstensen's emotional musical envelope. The early love song of Bertold Brecht and Franz S Bruinier, "Erinnerung an die Marie A.," gets a light, playful arrangement, performed by Augestad with the heartfelt, forgiving perspective of an adult who looks on her youthful, mischievous days. Erik Satie's sentimental waltz "Je Te Veux" is arranged for a duet by Augestad and Carstensen, both sounding as if they are dancing passionately around each other. A meditative version of George Friderich Händel's aria "Lascia ch'io pianga" follows, featuring a brilliant pedal steel guitar solo from Carstensen. The popular Renaissance/Baroque song "Une Jeune Filette" is performed in a charming, traditional dance form. Than Augestad sings Giuseppe Verdi's aria "Ave Maria" with dramatic control and reverence. The quintet concludes with a minimalistic arrangement of Henry Purcell "Hush, no more." Beautiful, elegant and highly creative performances of timeless songs. Track Listing: Flow My Tears; Come Again; Der Leiermann; La reine de Coeur; Les Chemins de l´amour; Erinnerung an die Marie A.; Je te veux; Lascia ch'io pianga; Une Jeune Filette; Ave Maria; Hush, no more. Personnel: Tora Augestad: vocal; Mathias Eick: trumpet; Stian Carstensen: accordion banjo, pedal steel guitar; Pål Hausken: drums; Martin Taxt: tuba.